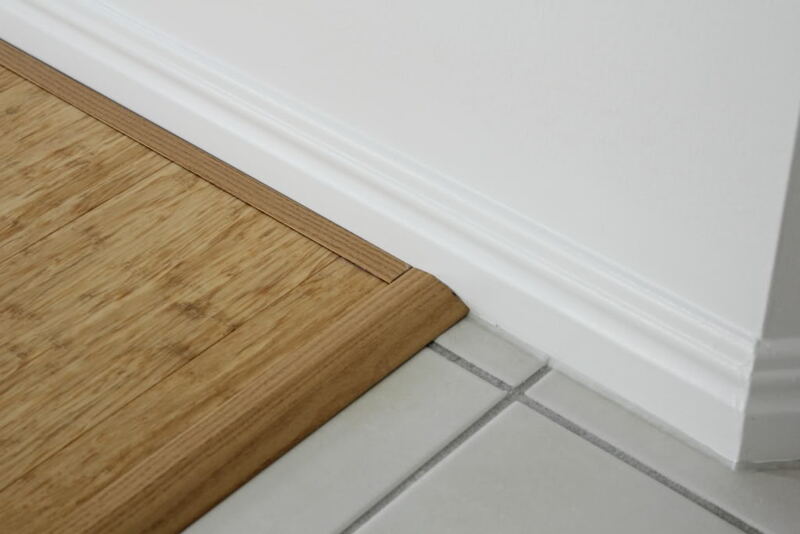 Polish your Hardwood Floors with the perfect Trim & Moldings! We are proud of our inventory of trim, moldings, reducer strips and stair noses. These items add the perfect finishing touches. Whether yours are damaged, need repair or replacement, Hardwood Floors Fort Worth is the place to go. Our Hardwood Floors inventory of premium hardwood trim and moldings gives our clients the opportunity to finish rooms with perfectly stated elegance. Our residential and commercial clientele are especially pleased with the enduring qualities that our extensive line of site-finished and pre-finished hardwood, softwood or exotic wood moldings and trim add to their investment. If maximizing the return on your hardwood flooring investment is important, please stop in our showroom or contact our Customer Care team to discuss your project and how it deserves to be finished. In addition to finished and unfinished hardwood baseboards, room dividers, two-surface transitions, we have hundreds of supporting trim and molding finishes that highlight your floor, room, home or office. At Hardwood Floors Fort Worth, our inventory includes the premium hardwood finishing touches that define your room. If you have a specific need and it is not in stock, we can custom order any finished or unfinished trim or molding to your precise specifications. To ensure the correct shade, finish and specifications, please reach out to our Customer Care team to receive valuable insight about the highest quality hardwood trim and molding manufacturers in the industry. At Hardwood Floors Fort Worth, we believe the job is not complete until the trim and moldings are in place. Stop by our showroom and see why! Whether you desire Quarter Sawn White Oak, Mahogany, Alder, Cedar, Brazilian Cherry or any other hardwood, softwood or exotic wood, our Customer Care team can locate the perfect hardwood trim or molding for your floor, room or office. Discover why our hardwood experts are regarded as the best in the Dallas – Fort Worth area. The following general descriptions are designed to give our clients a feel for the range of products in our hardwood trim and moldings inventory. Our Hardwood Floors inventory includes hundreds of choices. Threshold – This is a molding undercut that can be used against sliding door tracks, fireplaces, carpets, ceramic tile or any other feature. Our thresholds are installed to allow for future expansion and can be fastened directly to the subfloor with adhesives or nails. Reducer Strip – The Reducer Strip is used around fireplaces, doorways, as a room divider or to transition from the hardwood flooring to any adjacent floor covering. Nails, adhesives or even double-faced tape can be used to set the Reducer Strip in place. Step Down Molding – This molding protects and defines step and stair edges and helps resist large volumes of heavy foot traffic. These are popular samples of the amazing effects provided by our trim and molding experts. Every item in this inventory is designed to complete the floor, room or office with the quality and integrity your floor deserves.